F and I made the beeline for the voucher just after 7pm and it took some time to get going. I think the ticketing staff try to hold off swarms of people at the food stands… or maybe trying to space things out because there were some VIPs arriving. Aha, it was Sam Tan, the Minister of Culture, together with York Chor Tan, the Singapore Ambassador to France, and their entourage. 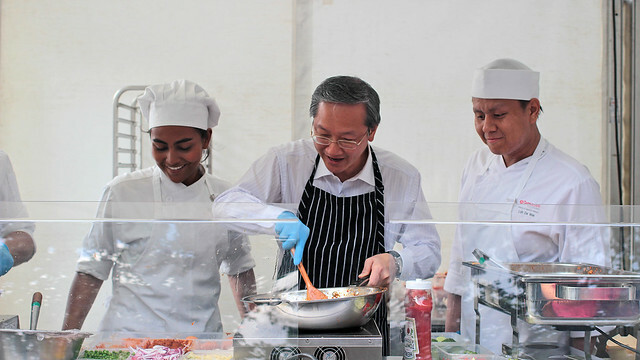 The Minister walked around and chatted with a few people, and even tried his hand at cooking mee goreng. 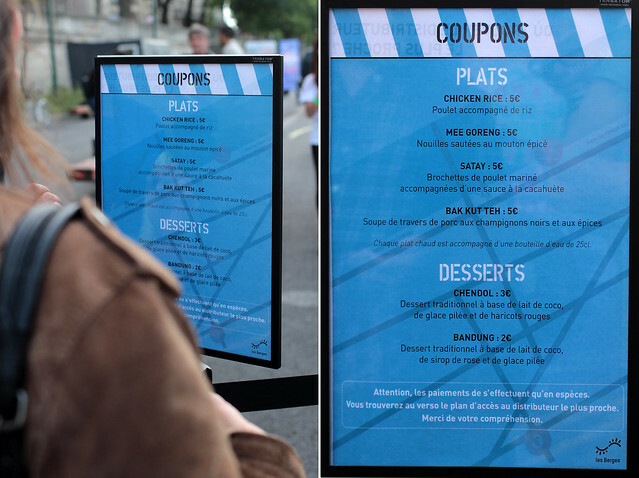 Finally, we got the vouchers we needed, along with some freebies – badges and bag – so time to grab some food as I was famished. But not so fast… the satay was still being patiently grilled and the chicken rice was temporarily off the menu because there weren’t any rice left. 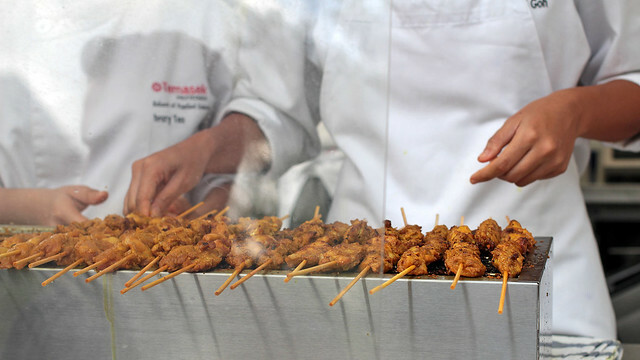 New strategy was needed – I continued to wait for the satay while F queued for the mee goreng. 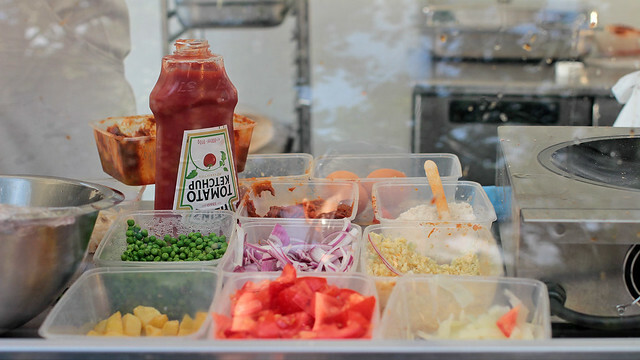 It was a pleasure to take comfort in some familiar food, although like most street food endeavours in Paris, there’s nothing endearing about endless queuing and waiting. 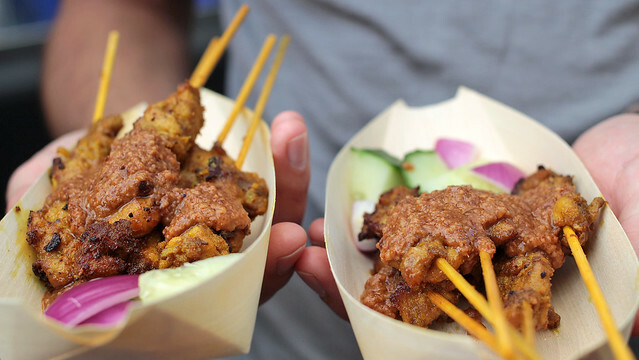 It always baffles me how differently street food are served in Asia and in Europe. What happened to quick, cheap and cheerful service? 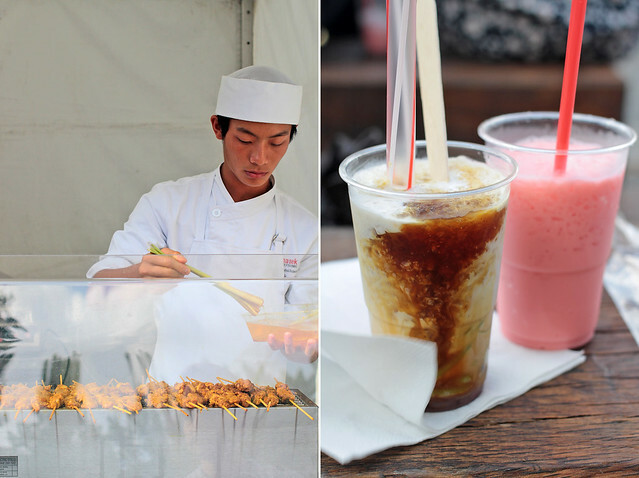 The Saveurs de Singapour does have a major bonus point going for them though – the prices are actually very reasonable (thanks to subsidies of the festival? ), and for every hot meal bought, they actually also give you a bottle of water. thanks for the preview ! I guess I might be happy having some cendol just to avoid the queues then. I guess if you time it well, you could get away with not queuing. Fingers crossed. haha, probably ! I find that they are less “Q” here but I reckon shorter cooking time and a dip in ice-cold water after might help. 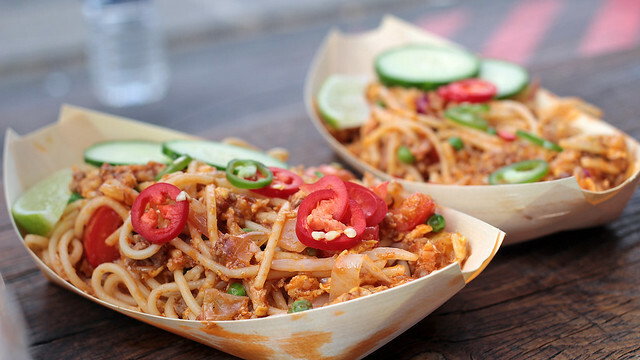 hooohoo…and the mee goreng? what noodles were used? ?